As there is such a wide range of profiles, patterns and colours available, it is not possible to quote over the phone. We will make an appointment to attend your property and provide a free design and quote. We will advise you on the most suitable and cost effective solution for you. For areas that covered by turf (lawn), the design of the Kwik Kerb is painted on the grass with the line marker. The turfed area is prepared using the Edgeprep® machine. This machine is able to remove grass to a consistent depth on the intended path for the Kwik Kerb®. The turf can then be rolled up to be removed. The Kwik Kerb® operator will fill the Edgemaster® machine with the concrete mix, which will then self-propel while extruding the concrete kerbing behind the machine. Adjustments are made with height and steering to ensure a consistent smooth kerb. The Edgemaster® will lay the majority of the Kwik Kerb; however there will always be sections that need to be formed by hand. Corners or the end of a kerb between to walls. Kwik Kerb operators are trained to ensure that these sections fit seamlessly into the rest of the machine laid kerb. A cut is made into the concrete at regular intervals. Expansion joints are placed so that once the concrete has cured and is then subject to ground movement or fluctuating temperatures, any cracking that occurs should be confined to the expansion joints. Kwik Kerb® has two main finishing styles EuroStyle® (Slate, Rustic Wood and plain colour) and EuroBrick® and brick and mortar paving style to your kerbing. These patterned finishes are patented and exclusive to Kwik Kerb® Business Owners. To see more of these styles see our Shapes – Colours – Styles page. 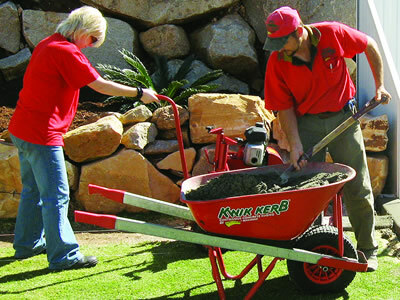 If you are looking to get some kerbing at your house, Kwik Kerb® has hundreds of Business Owners around Australia so chances are Kwik Kerb® is available in your area. Please fill in the contact form to have a local operator contact you to set up a time for a free no obligation quote.